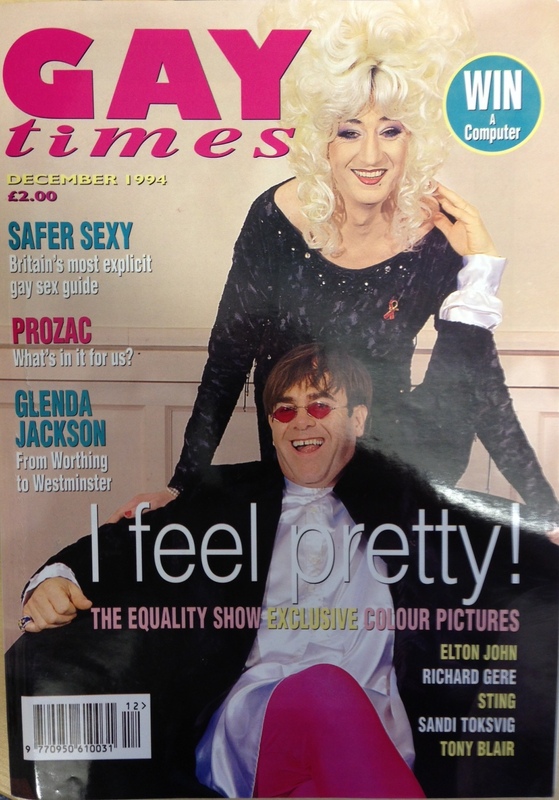 Recently I inherited (after a colleague retired) a large collection of LGBT magazines and ephemera stretching back to the early 1980s. 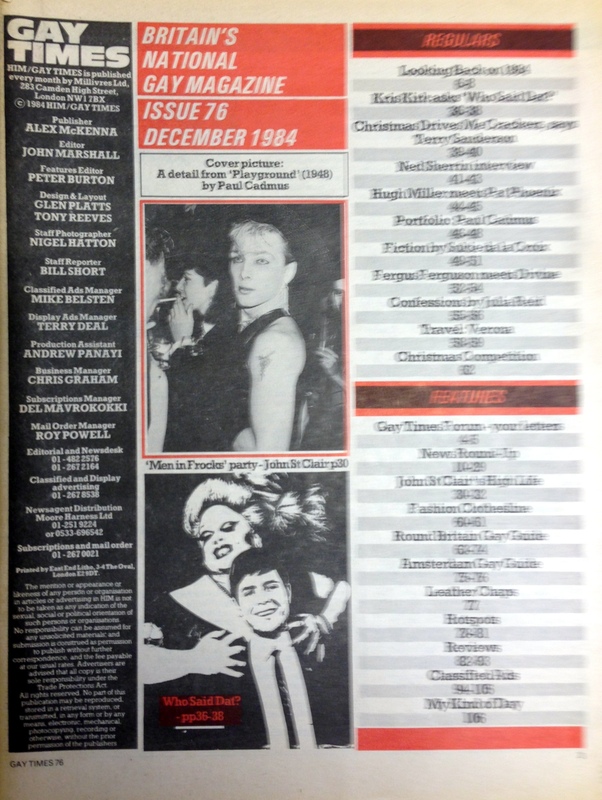 These include numerous editions of Gay Scotland and Gay Times, which are helpful resources when examining the development of LGBT culture over the past 30 years. 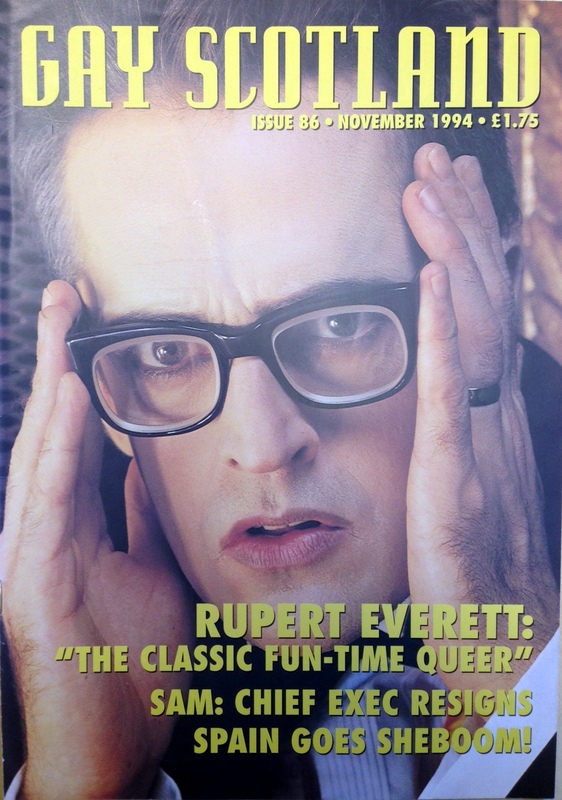 Take, for example, this issue of Gay Scotland from Jan/Feb 1984 – a Science Fiction special. At this time the magazine had a circulation of around 8,000 with the majority of readers subscribing or buying a copy from gay bars and clubs. What is noticeable from the content is that the magazine contains significantly less advertising space than more recent magazines, and offers a plentiful supply of news items, which are unsurprisingly related to LGBT interests and the continuing pursuit of equality and an end to discrimination. What interested me was the section ‘Scenearound’ detailing places and spaces for LGBT Scots to socialise. A snapshot of the gay ‘scene’ in 1984 offers some opportunity to consider how the ‘scene’ had developed after 1980. There were gay/mixed spaces prior to 1980; in Glasgow; there was the Close Theatre bar, Guys, The Royal, the coffee bar in the Central Hotel, Top Spot Mexicana, The Strand, the Corn Exchange, and Tennent’s to name a few, but after 1980 there was growing confidence that commercial premises catering for the LGBT population could be profitable and offer a safe(r) experience for Glaswegian LGBTs. 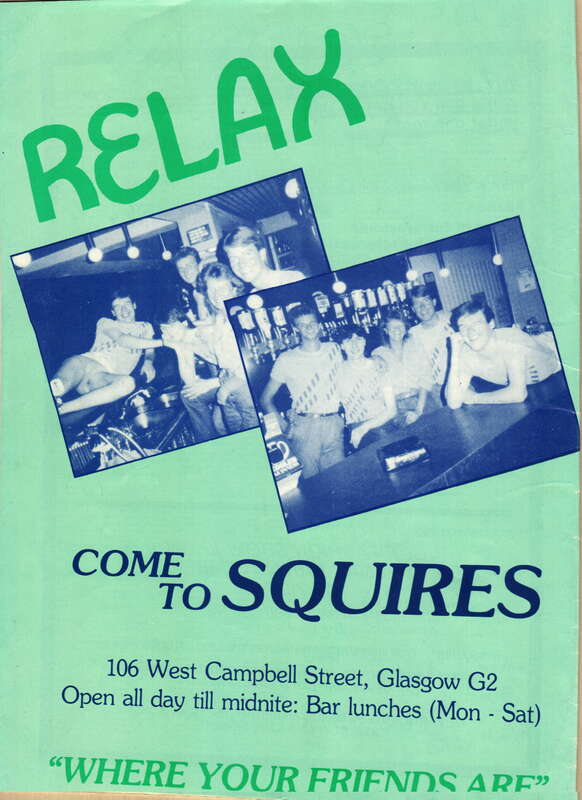 According to the listings there were 13 gay or gay ‘friendly’ pubs ‘n clubs in Glasgow in 1984. Some will be familiar to those of us ‘of a certain age’: Court Bar, Squires, Tennents, The Waterloo, Bennets. But there are more: Bardot’s at 72-74 Broomielaw, incorporating La Maison & Le Village; Studio One on Byres Road (mainly Sundays); Vintners, Panama Jax, and Halibees Cafe Cabaret. However, due to the transient nature of many ‘gay’ venues, by November Bardot’s seems to have disappeared, and Halibees is no longer listed. New entries include Cul de Sac on Ashton Lane, Chippendales on Clyde Street, & The Winter Green Cafe. Editorial notes offer readers a glimpse of what to expect: Duke of Wellington – ‘rough, but ready clientele’; Vintners – ‘busy [and] cruisy’; Cul de Sac – ‘trendy…popular with a certain ‘set’; Squires – ‘up market…popular with tourists’. If we leap forward another 10 years to July 1994, Glasgow had 16 venues listed, including a new generation of gay pubs ‘n clubs; much more commercial and appealing to the ‘pink pound’ younger market. Café Delmonicas, Club X, and Mondays at The Tunnel boasted a much more music-oriented culture. The ‘old guard’ were still represented by the Court Bar, Squires, The Waterloo, Austins and, to some extent, Bennet’s but the 90s saw the emergence of a distinctly different form of gay leisure culture. This new culture was characterised by a more confident and market-savvy approach that relied upon a younger and more affluent customer base. Characterful, they were not. But this gay scene was replicating the changes that were occurring more broadly within the leisure industry, which was becoming a more customer-driven platform, and introduced a new phase in the evolution of gay commercial culture in Scotland which saw an alignment with the mainstream. The language of gay Scottish leisure changed too. Whereas venues in the 1980s might have been described as ‘discreet’, ‘cruisy’, ‘closeted’ or ‘tolerant’, by the mid 1990s such descriptions were absent. These changes were replicated in the LGBT publications of the period too, which reflected increased revenue, appeal, and confidence and were able to expand content to include more than activism and awareness of LGBT issues. The ‘streamlining’ of commercial gay culture in Scotland has led, in some instances, to the narrowing of its appeal. Modern venuesmay be guilty of permitting market forces to disregard sections of the community: the older and less well off, in its drive for profitability and commercial appeal, with LGBT 0ver 50s frequenting venues in fewer numbers. This was certainly a feature evident from my research with gay and bisexual men over 50; some of whom felt that this drive towards profitability over community was gradually excluding the more mature or alternative ‘markets.